How cool is this? The Primaries have been practicing their skills using a variety of media to create these colorful collages. 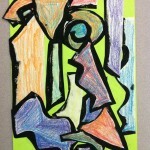 In the process they have begun to learn and use art vocabulary like line, shape and color.